Showing the great thickness of the Compuchron (15 mm/0.6"). 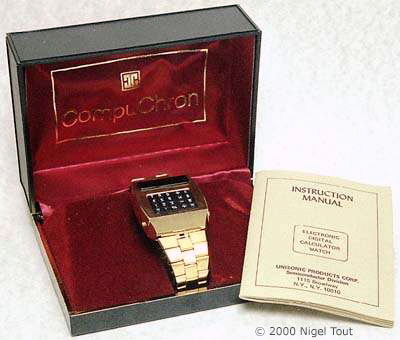 Distinctive features: Electronic calculator watch. Display is 8 digits, red LED. The display is only active for a short period after use. 4-function, %, memory, time & date. Calculator/watch electronics 2.5v (2x button cells), LED display 2.5v (2x button cells). Size of calculator/watch case 38 x 47 x 15 mm. (1.5" x 1.85" x 0.6"). Case made in Japan, electronics module made in Mexico. Like all LED calculator watches, since the display uses so much power the time is only displayed for a few seconds after pressing the button on the side. The display is also lit during calculations but goes out within a few seconds if no button is touched. Answers can be redisplayed by pressing the "=" button. A Compuchron in its case. A less common gold finish Compuchron alongside the stainless steel version. 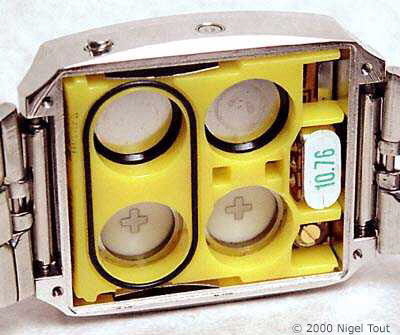 The 4 button cells needed. 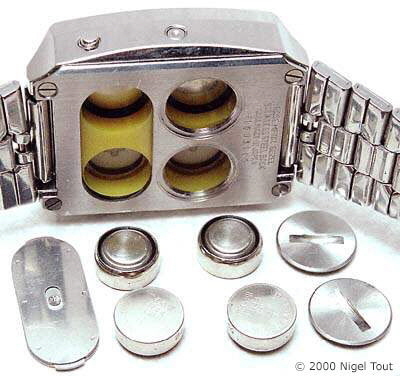 The 2 on the right power the watch & calculator electronics, and the 2 on the left power the LED display. The crystal oscillator is on the right and has a label with the date of manufacture stuck on it. Below it can be seen the screw of the variable capacitor used for altering the oscillator frequency to regulate the time keeping. The electronic module completely removed from the case, showing the 7-segment LED arrays along the top. 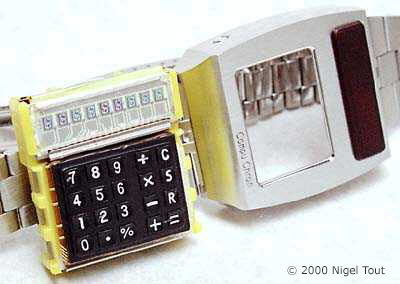 By 1975 the electronics required for a calculator had shrunk so much that it could be shoe-horned into a watch casing. 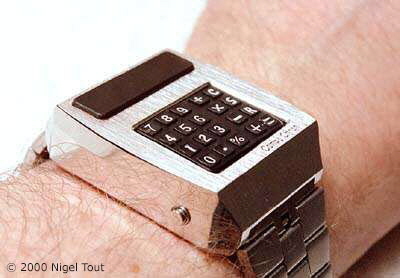 The first was the Pulsar calculator watch. This was followed over the next couple of years by models from Hewlett Packard (HP-01), Compuchron, and Uranus - all with LED displays. 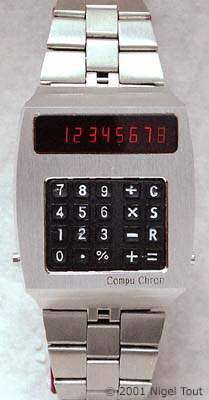 Sinclair produced an LED wrist calculator, but without the time function. 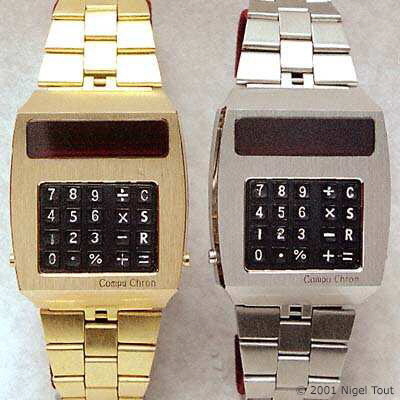 LED calculator watches were marketed for only a few years before being replaced by LCD (Liquid Crystal Display) version, which have much lower power consumption and display the time continuously. The rate of development was so fast that LED watches and calculator watches were often left unsold, and are now sometimes available to collectors as new old stock (NOS). There is much fascinating information about LED watches, including details of some very rare models, at Crazy Watches site at http://www.crazywatches.pl/led,1 and Guy Ball's site at http://www.ledwatches.net.